This week, I’m stepping from out behind the curtain to try being a contestant in a local social media contest. A local Saab dealership is holding a contest where 100 people each week receive a Saab to drive around. Our goal as drivers is to get people to be our “fan” on a contest page and to snap the 2 QR codes on the car, one on each of the back windows and one on the interior (which is worth more points.) Contestants also receive points if someone scans a QR code on the car and then visits one of the contest sponsors where there’s another code that earns the customer a discount or benefit. The people I’ve shown the car to so far have been most excited by the fact they get a free coffee at Dunkin’ Donuts if they scan the car. 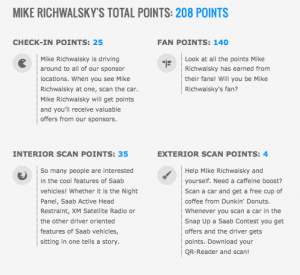 Finally, I’ll receive points for each time I post a photo of the car. I’ve put up a few so far, and the process has been smooth and easy. After a semi-final round, finalists will select 1 of 5 boxes, each containing a key. If the key opens the Saab, you win the car. Personally, I don’t really need a new car, but I could use the money to re-do our basement, trashed this year in floods. Anyways, to play the part of good contestant, I need to ask for your help and tap into my social capital. Here’s how you can help. It’s okay if you’re not in the northeast Ohio area or even in the USA, you can “like” me from anywhere, as well as scan the QR code. You might not get a free coffee, but you’ll be helping me out. Click on that “become a fan” link, where you’ll be prompted for an email address. I’ve been promised the emails won’t be spammed by the dealership, but to be safe, use that second or third Gmail account you have for stuff like this. 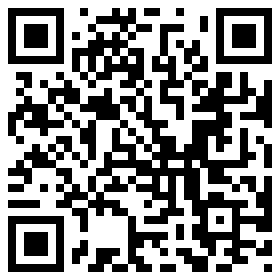 If you don’t want to go through all the trouble, just visit this link, which the QR code takes you to. You’ll be asked for your location, so it can find the closest sponsor location to you. So, that’s how you can help. Now, let me put on my marketing hat for a bit. So far, the contest has been managed and handled very well, which is key. They held an orientation session last week for participants where the rules were explained, forms completed and there was food. There have been constant email communications from the dealer to participants with updates and schedules, which has been helpful. On Sunday, when I picked up my car, there was a good check-in system, where the last of the paperwork was completed and any questions I had were answered. From there, I was off the pick-up area, where my car was brought up from the lot. I was walked through the vehicle and off I went. All in all, a good system was in place and there were plenty of people staffing the various areas so there was no wait. I’ll return the car on Saturday and expect the same setup upon check-in. From a technology standpoint, the contest site is set up well, works well in mobile browsers and image uploads by contestants are stored and served from Amazon S3. I don’t know if this is being run by a national company that sells this product to local dealerships, but it’s put together very well and the design is nice. So, I’m two days in so far. The car’s fun to drive (and fast, thank you, Turbo.) I wish it had a hookup for my iPhone, like my Hyundai does, but beggars can’t be choosers. Thanks for your help. I’ll update later in the week on my progress. Previous Previous post: So We Have Google+ Pages, Now What?